They might not make global headlines, but for low-lying Pacific islands king tides are an ever-increasing threat. As sea levels rise, the highest tides can have catastrophic effects, particularly when combined with storm conditions. In December 2012, eight people died and 20,000 homes were destroyed when Tropical Cyclone Evan caused flash flooding in Fiji, Samoa and the Solomon Islands, among others. And in March this year, the capital of the Republic of the Marshall Islands, Majuro, was flooded for the third time in 12 months. 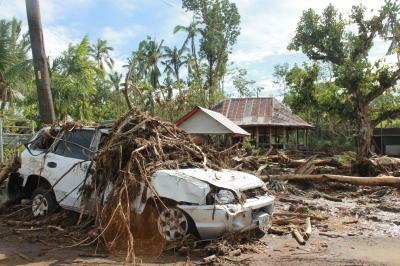 Several homes were destroyed and almost 1000 people sought shelter in temporary relief centres. More than half of Pacific Islanders live within 1.5 kilometres of shore. In such a precarious environment, it is critical that inhabitants receive flood warnings as soon as possible. According to Professor Elisabeth Holland, Professor of Climate Change and Director of the Pacific Centre for Environment and Sustainable Development at the University of the South Pacific, radio remains the best way to get the word out early. The Secretariat of the Pacific Regional Environmental Programme (SPREP), the body responsible for environmental protection in the Pacific, is also integrating meteorological forecasting with mobile phones to facilitate warnings by text message. In Brussels recently for the Second Regional Technical Meeting of the Global Climate Change Alliance* Intra-ACP Programme, Prof. Holland highlighted the European Union’s funding for cell phone networks on outer Pacific islands where it is not profitable for commercial carriers to provide coverage. According to Prof. Holland, accessing climate finance has proved difficult in the Pacific. SPREP has just been approved as a Regional Implementing Entity to receive direct transfers from the global climate Adaptation Fund, but no Pacific country has yet fulfilled the requirements to be a National Implementing Entity. The University of the South Pacific offers a number of postgraduate qualifications in climate change, and 30 percent of its 282 postgraduate students are already employed by national governments, NGOs or the private sector. “Part of capacity building is hiring the most talented students, the best trained students for the projects that you are implementing,” Prof. Holland says. Given the large distances between islands many people choose to study online. Prof. Holland explains that students act as intermediaries, combining modern science with age-old local knowledge held by older generations about how the islands once looked. In fulfilling this role, she and her colleagues found students lacked not skills but confidence. One young woman seemingly not lacking in confidence is Kathy Jetnil-Kijiner from the Marshall Islands. Her oral poetry highlights the threats posed by climate change, as well as the legacy of nuclear tests in the Pacific. A video of her performing her poem ‘Tell Them’, about rising sea-levels, is here. “It is the best description of the impact at that heart level, at the soul level, of what it could mean to be separated from the place that you regard as home,” Prof. Holland says. The same production will feature at the UN Conference on Small Island Developing States in Samoa this September. A recent blog post by Ms Jetnil-Kijiner may also contain lessons for development practitioners as she describes why her oral poetry – also known as SLAM poetry – reached a wider audience than other works published in a local newspaper. By caribbeanclimate in News on June 27, 2014 .